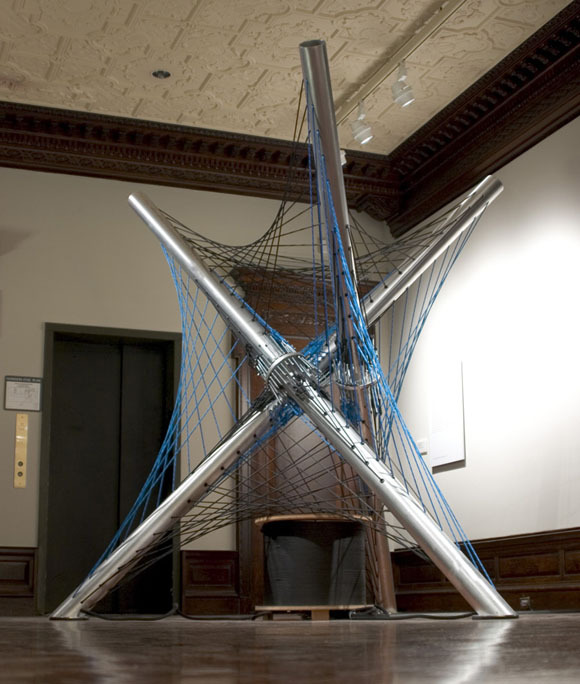 Rope and Sound is an installation that uses rope tension to control sound. Pull on a cord, and the change in tension triggers electronic thuds and mellow chimes. The trick is conductive fibers braided into the rope; as the tension changes, the conduction of the rope changes, as well. I got a chance to try out the installation at New York’s Cooper-Hewitt National Design Museum. The show is up through October 30 and well worth a visit if you’re passing through town. The installation is beautiful and the concept brilliant, but the sound aspect was somewhat disappointing. The sounds themselves were compelling, but the ropes act like simple buttons: sounds are triggered as you cross a set threshold. If the whole point is the ability to monitor stress, why doesn’t that translate into sound? A velocity-sensitive keyboard is more expressive. That said, I think the underlying concept is terrific, so expect to see more use of conductive fibers in new sound interfaces. If you’re near Emoryville, California, you can meet up with the Squid Labs folks who built this and other projects. (via O’Reilly Radar) And you can even one-up them by showing your own project. If you go, let me know what goes down! [UPDATE:] I went to the source and asked Ben Recht (MIT Media Lab) about why the strings weren’t sensitive. In fact, they were! The reason they modulated timbre and not velocity was that he felt velocity was too hard to calibrate for different visitors. (And, obviously calibration is an issue, since I didn’t notice the timbre modulation.) This certainly demonstrates the challenges in designing new interfaces. And it also suggests that even with new designs, you need musicians to become adept at using the interface expressively.